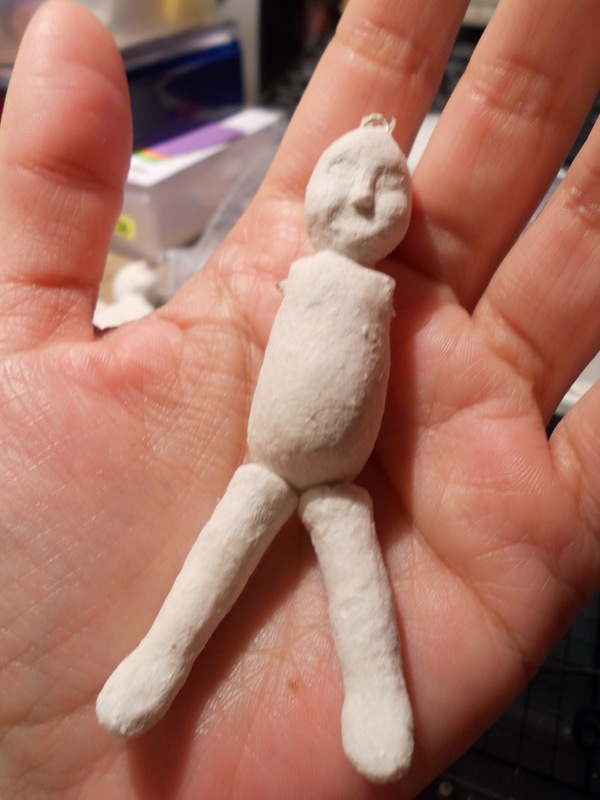 I started building him from a flat silhouette made of cold porcelain, I had originally meant to make a flat doll but was very taken by the model of a doll’s head carved on wood that I saw at Elsita Mora’s blog about hand made dolls, which is truly a beauty! I added tiny bits of tissue paper using watered down cold porcelain as a binder. After it had dried up then I would sand it a bit, add some more and sand some more, over and over, until it started taking shape! I really love the angles on a child’s head and I felt very happy looking at the shades they would cast. It seemed as if he had the softest kindest smile just waiting to be painted on his face. I was very eager at that point to know what it would feel like to paint a face on a three-dimensional tiny baby/toddler’s head since I had not sculpted one before. Then I made him a little pot-belly and sanded him some more. After that I forgot to take pictures if how I made his arms and legs but it seems like a good thing now because there are so many pictures already! I’m trying to make up my mind between a set of paper mache wings or embroidering over felt or fabric. Do you have a Facebook fan page for your site?